This week the U.S. Fish and Wildlife Service announced it will begin the procedure to potentially remove the Kirtland’s warbler from the federal list of threatened and endangered species. The proposed delisting now enters a 90-day public comment period and a final decision is expected within a year. This is great news for anybody who thinks every species on earth is worth saving. In honor of the announcement Jim DuFresne, MichiganTrailMaps.com’s main blogger, wrote about his first Kirtland’s Warbler’s tour, concluding there isn’t another outdoor tour like it in Michigan and maybe anywhere in the country. Of the 12 people that participated in my first Kirtland’s Warbler tour at the US Forest Service office in Mio, I was an odd bird. It wasn’t because I lacked a powerful spotting scope on a tripod or a personalized leather carrying case for my bird book. I stood out because I was the only one from Michigan. There was a couple from Seattle, another from Oklahoma, a birder who migrated north from Tennessee and one from Washington, D.C.
“We have people coming from all over the world to take this tour,” said a USFS biologist. Indeed. Our group also included Larry and Brigitte deMarch who drove down from Winnipeg and three Englishmen. 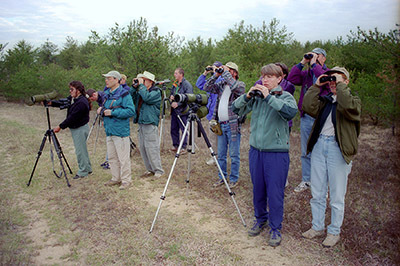 The British birders were here for two weeks and their itinerary included Point Pele in Ontario and Whitefish Point in the Upper Peninsula. But the real reason for crossing the Atlantic was to see a Kirtland’s warbler. But to many birders around the world the allure of the Kirtland is how rare it is and how close the species came to becoming extinct. Birders search for a Kirtland’s Warbler among the jack pines in the Huron National Forest during a Kirtland’s Warbler tour. 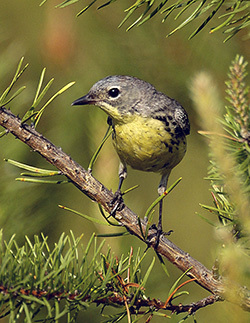 Unlike many other warblers, the Kirtland evolved into a highly habitat-specific species, a ground nester that would only breed underneath the protective branches of jack pines from five to 16 feet in height. Between loggers clear-cutting and Smokey The Bear preventing forest fires, the Kirtland’s habitat – Christmas tree-size jack pines growing in sandy soil – decreased and so did its numbers. By 1987, the world’s entire population consisted of 167 pairs of breeding birds that could be found nesting in a seven-county region of the Lower Peninsula. By then the USFS, the Department of Natural Resources and the US Fish & Wildlife Service (USF&W) had already formed a Kirtland’s Warbler Recovery Team and were conducting a program of habitat management. The agencies used the combination of clear-cutting older jack pine forests, controlled burning and replanting to mimic the effects of wildfires. The species began to stage a turnaround in the early 1990s and in 1994 663 breeding pairs were located in Michigan. The most recent count, in 2015, turned up 2,383 singing males, or a total population estimated at more than 4,000 when the females are included. Although the Michigan Audubon Society also offers tours in Grayling and warblers are now nesting in the Upper Peninsula, Wisconsin and Ontario, Mio is still the Kirtland capital of the world. More than 90 percent of the warblers’ nest within a 50-mile radius of this Oscoda town while downtown there is glass-encased statue of the bird that was dedicated by the late Roger Tory Peterson. Since most of the prime nesting areas are closed to public entry, the only way to see a Kirtland is to join a tour. This year the USFS is charging $10 for the two-hour outing but the fee hasn’t deterred anybody from signing up. Certainly not our group. 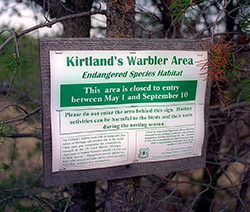 Much of the prime Kirtland’s Warbler breeding grounds are closed to the public except on guided tours. The morning began with a short video on the Kirtland and then we piled into our cars, drove 20 minutes along sandy two-tracks into the heart of jack pine country and parked. Lugging spotting scopes, binoculars, cameras with cannon-like lenses, we continued quietly on foot, using a simple strategy for finding the bird. “Listen carefully for that male and then zoom in,” our USFS guide said. “There’s one!” someone said and all conversations were immediately replaced by hushed whispers. In a small clearing we set our scopes and began to search in the direction of that distinct song. “Got him!” Larry deMarch said. The bird was sitting at the top of dead tree trunk, bobbing its tail and singing its tune. It stayed there for almost five minutes, flew away and then – to the delight of everybody – came back for an encore. “Oh my, that’s good display, he couldn’t be more cooperative if we asked him,” deMarch’s wife said. On the half-mile hike back to our cars there was an air of relief and satisfaction from this group of people who had traveled so far to see such a rare bird. Barnes was telling me how he will be the envy of all his friends at home. “You Yanks don’t know how good you have it over here,” he said. Kirtland’s warbler tours will be offered daily from May 15 through May 31, 7 days a week at the Mio Ranger District of the Huron National Forest. Reservations are not required, but are recommended for groups of four or larger. The Kirtland’s warbler tour costs $10 per adult and is free for children. Funds from the tours help cover costs associated with the tours. For more information, call the Mio Ranger District office at (989) 826-3252.